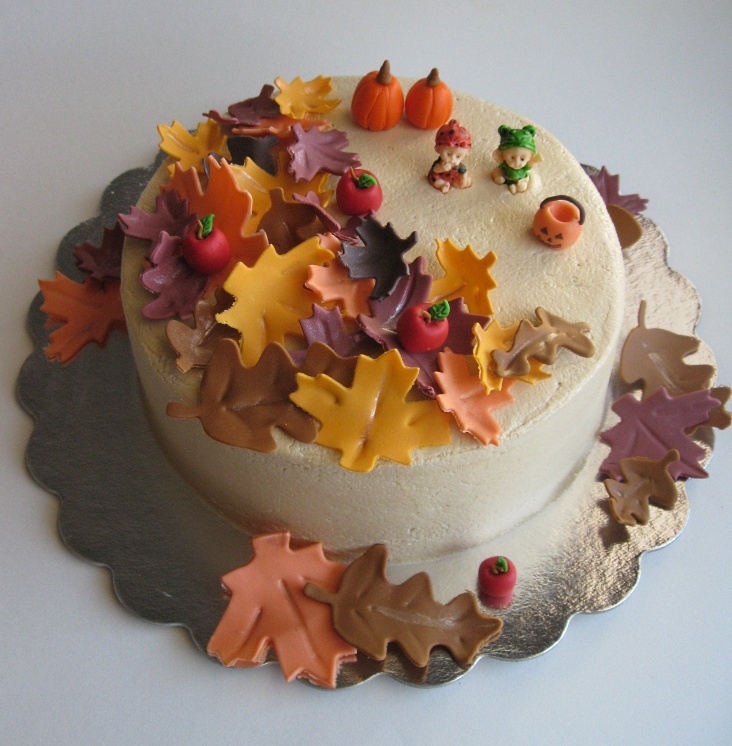 The folks at US Confection Connection and The Daring Kitchen (Daring Bakers are a part of The Daring Kitchen) have announced a cake decorating contest with theme of “Autumn”. One winner will be chosen from a list of ten finalists and the winner gets an all expense paid trip to New York City, to attend the NY Cake Convention being held from Jan 2nd - Jan 5th 2010. We were required to create a cake to depict what Autumn meant to us.To me, Autumn brings to mind, colorful leaves and the fun part of Halloween. Kids dressed up in cute cuddly costumes going trick or treating on a chilly Autumn evening, the thought makes me break into a smile. I wanted to bring out these two aspects in my cake and this is what I came up with. All decorations – apples, pumpkins, kids in costumes and fall leaves are made out of a fondant-gumpaste mix and are completely edible. The cake is a sour cream pound cake with a chocolate ganache filling and frosted with buttercream. The rules of the contest and event details are here. This is my first time participating in a cake decorating contest, and I am excited. The winners will be announced on the Daring Kitchen forum on the 14th of Nov.
Hi, I have been a silent observer of you blog for a couple of weeks. This cake represents fall in a very thoughtful and honest way. Its beautiful. Hope you win this competition. very wonderfully made.. like all things on that cake. all the very best..
A lovely wonderful and nice cake with cute decorations and also very tempting. What should I say Namratha. your decorations are always classy and neat. a visual treat i must say. all the best for the contest. just a lil query...how your cakes have flat tops? mine puffs up a little at the center while baking. This is beautiful- you captured the rich, warm colors of autumn. I think you have a winner here! Good luck! WAW!lovely...the pumpkin and leaves r very adorable. good luck for the contest. that's so creative! i hope you win cuz the prize sounds amazing :)let us know if we need to vote! Beautiful cake. I am so impressed with your the little children you molded - they look like real dolls! Namratha, you've captured the essence of autumn beautifully here. The decorations look really nice. Have you made marzipan babies? I came across some while I was looking for something else and I was so impressed with what I saw! Lakshmi, thank you for leaving a comment and for your wishes.
) to remove the tops making them even. I also use Wilton baking strips (http://www.wilton.com/store/site/product.cfm?id=3E30D620-475A-BAC0-592117323818A1AA&killnav=1) which minimize raised tops. Ramya, yes I made those itty bitty babies(that's what I like to call them :D) I used a sugar mold to make them. TBC, I made the babies out of fondant and gum paste mix. Marzipan molded stuff is amazing too.